Record Camera To FLV (RecCam2FLV) is a function packed web-based application that records capture devices such as camera, webcam... on user PC and stores as FLV files on server using Flash streaming technology. Record quality can be controlled by user. When stop recording, FLV file is immediately created on Red5 Server without extra time for upload. User can also replay recorded FLV file or record again. ...... User can also replay recorded FLV file or record again. 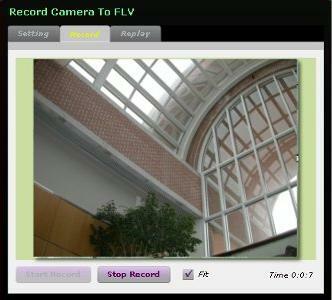 Record Camera To FLV can be used in movie streaming website, e-learning with virtual desktop camera or something similar. Record Camera To FLV is very easy to setup and use without programming skill. - if quality of movie is low so reduce bandwidth and record again. - sourcecode is included in purchased package. It can record DVD sound to wav format. Qweas is providing links to Record Camera To FLV 1.2 as a courtesy, and makes no representations regarding Record Camera To FLV or any other applications or any information related thereto. Any questions, complaints or claims regarding this application Record Camera To FLV 1.2 must be directed to the appropriate software vendor. You may click the publisher link of Record Camera To FLV on the top of this page to get more details about the vendor.